We hope you'll consider giving to Iowa AEYC this year. What could you be supporting with this effort? Leadership development in our volunteer board/committee members, and through our Leadership Fellowship projects. Public policy and advocacy efforts to support high quality early care and education services, and to make significant change as we serve and act on behalf of the early childhood profession. Update equipment with new technology and allow us to do more through distance communication (cameras for our computers for using Skype and producing webinars). Support out-of-state travel for board members and other leaders to bring Iowa experts to national events. To provide written materials and resources for our staff and volunteers to be as effective as possible. Special recognitions and thank you gifts to leaders on our board, to our volunteers, and to our college student interns. Support the costs of financial incentives to participants in our projects who might need extra supports not covered by the contracts we receive. Any size gift, from $5 to $5,000, is greatly appreciated. We will recognize all contributions with a letter for tax purposes. Many thanks to many of you who have made a contribution in the past. Every day, we see the Association, together with all of you, taking baby steps to change the world for a child care provider, a child, a program, a family, and Iowa AEYC member, or our field. 1. If you are a state employee you may give through the state's One Gift Campaign. Just go to their website. 3. Contribute by clicking on the donate button below. Another Very Simple Way to Donate! - Amazon donates 0.5% of your elgible purchases to the charitable organization of your choice. - AmazonSmile is the same Amazon you know. Same products, same prices, same services. 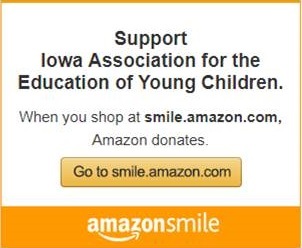 - Support Iowa Association for the Education of Young Children by starting your shopping at Amazon Smile. This link -- https://smile.amazon.com/ch/42-1135283 will take you to smile.amazon.com in support of Iowa AEYC. and the child care programs who co-sponsor a T.E.A.C.H. scholarship recipient.